5’8 McCoy Cheyne Horan model Lazor Zap. Only a few minor dings which have been repaired. 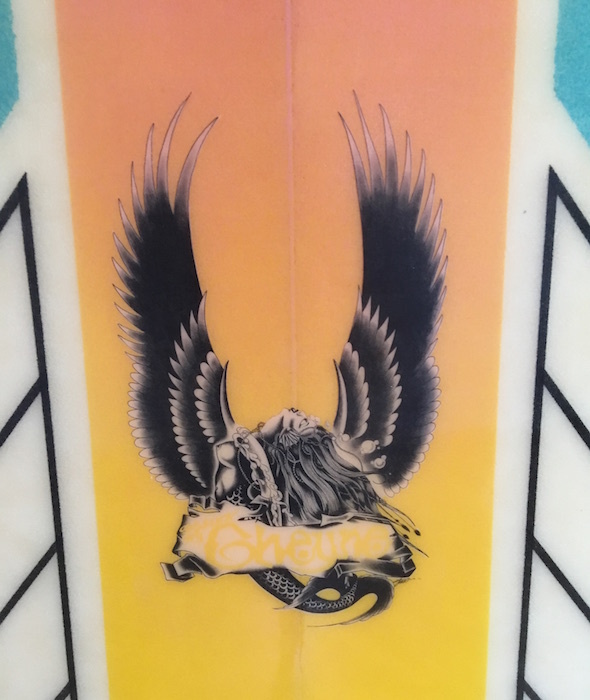 Overall great condition with vibrant air brush. 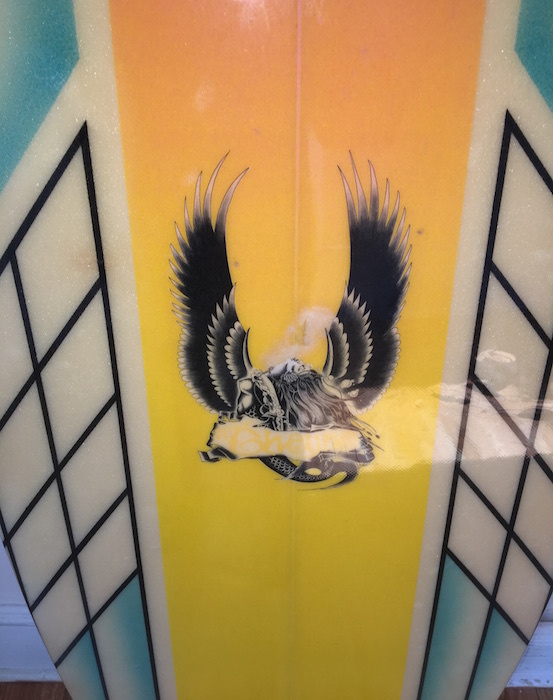 Rare board! Cheyne Horan: Creative and eccentric Australian pro surfer from Sydney’s Bondi Beach; runner-up to the world championship in 1978, 1979, 1981, and 1982. Horan was born (1960) in Sydney, the son of a former national speed-skating champion, and grew up in the beachside suburb of Bronte. He began surfing at 11, and three years later was the juniors division state champion and one of the country’s top skateboarders. Horan was by then a full-blown teenage surfing sensation. He rode in a low, open-kneed squat, weight distributed evenly over a pair of enormous thighs (his surf trunks had to be custom-tailored to fit his legs) in what was sometimes called the “horse stance.” Instantly recognizable by his white-blond hair and flamboyantly colored boards and wetsuits, Horan maneuvered almost exclusively in and around the wave pocket, turning constantly and often folding himself into a muscle-flexed tube stance. He’s often credited as the inventor of the floater maneuver, where the surfer rides laterally across the the whitewater, and was an early proponent of the aerial. Horan’s world tour ranking slipped over the next five years, from third in 1983 to 24th in 1987. The 29-year-old then came back to win the season-ending 1987 Billabong Pro in Hawaii, earning $50,000—the sport’s richest cash prize up to that point. His year-end rating went back to 14th, and he remained on the world tour for another four mostly undistinguished seasons. He retired at the end of 1993 with 12 world tour career victories, including a popular win in the 1982 Op Pro in Huntington Beach. In the mid-’90s Horan reinvented himself as a big-wave surfer. He was a regular invitee to the Quiksilver in Memory of Eddie Aikau contest at Waimea Bay, and finished fifth in the 2002 Tow-In World Cup, held in 35-foot- plus surf at Jaws in Maui. In 2003 he finished secondin the “biggest wave” category at the Billabong XXL Awards for a 60-footer he rode at Jaws. Horan won the 1983 Surfer Magazine Readers Poll Award. He appeared in more than 50 surf movies and videos, including Free Ride: Take 2 (1978), We Got Surf (1981), Follow the Sun (1983), Waterborn (1987), Surfers: The Movie (1990), and Biggest Wednesday (1998). Scream in Blue, a compelling and unvarnished documentary on Horan’s rocky 1985 world tour campaign, was released in 1986. In the finals of the 1999 Quiksilver Masters World Championships, a pro event held for surfers 36 and older, Horan defeated Wayne Bartholomew—the surfer he’d finished second to in the world title race nearly 20 years earlier. In 2007, Horan was elected to the Australian Surfing Hall of Fame. Since 1999, he has run the Cheyne Horan School of Surf in Queensland, Australia.